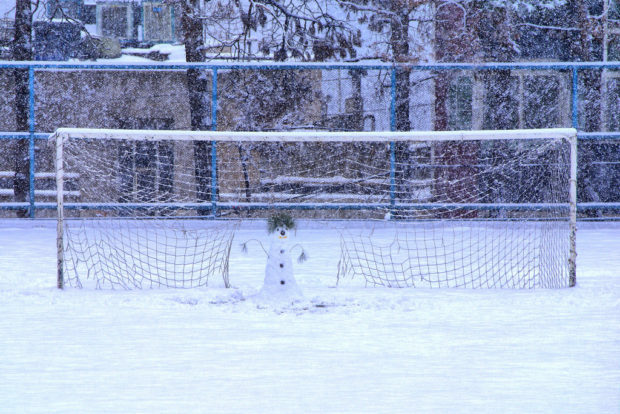 Football in the snow is great fun. If you’re either a kid out playing in it, your team is winning in it, or you’re tuned in from afar as a neutral watching a match in a nice warm house. When it’s your team playing in farcical conditions, it’s just ridiculous. When it’s in a league that has ambitions to be one of the top ones in the world, it’s just ludicrous and embarrassing. This was a game that would have been abandoned in most other countries. You can’t fully blame the snow for the Whitecaps capitulation in Utah. Sandy it certainly wasn’t, as the depth of the snow piled up during the second half. It was the same for both sides after all and Real Salt Lake adapted to it much better with a team that seemed more capable and more up for it from the first whistle. In the end three second half goals handed the Whitecaps another defeat, with Slovakian playmaker Albert Rusnák the difference maker with a goal and two assists, as Yura Movsisyan and Luke Mulholland killed the tie off late on with two goals in a four minute spell. Carl Robinson rang the changes, six from last weekend’s win over LA, surprising everyone with a 3-5-2 formation that saw three centre backs (Tim Parker, Kendall Waston, Christian Dean) and three DMs (Matias Laba, Tony Tchani, and Russell Teibert) start the first half, yet saw them pulled all over the place and only lucky to hang on through some truly woeful RSL finishing. Robinson has always said he would only play 3-5-2 if he had the right players to do it. Tonight showed that team on the park weren’t the right players. It was a dreadful performance for the most part with too many players posted missing. The home side started the livelier, but it was an incredibly open and end to end game, with both defences stretched as the snow came down, but neither team seemed to have their shooting boots on. The usual Cap killer Joao Plata had two excellent chances in the opening seven minutes but couldn’t get either on target to test David Ousted. The ‘Caps had their first chance in the 14th minute when Marcel de Jong whipped in a tasty first time low cross from the left, but Fredy Montero just couldn’t get on to it. RSL responded with a great chance for Yura Movsisyan which he hit wide. Plata had another gilt-edged chance in the 24th minute when the wee man got goal side of De Jong but couldn’t connect on a dangerous cross to the back post. As the snow got heavier, the conditions got slippier and Ousted was lucky to see a fumbled shot from Rusnák fly over his hands but around the post for a corner. Vancouver must have headed in to half time wondering how many rabbits feet they were carrying when RSL squandered another excellent opportunity after Movsisyan blasted over from six yards out. But the ‘Caps luck held and they headed in with the teams scoreless. The snow started to come down hard during the break and continued for the second half, turning the pitch from green to pure white and become frankly unplayable. But this game was in America, so even though the orange ball clearly wasn’t running, this game was going on. It continued to be end to end but the conditions weren’t making for pretty football. RSL were coping far better in them though and they took the lead in the 54th minute when the ‘Caps were caught with two at the back and Albert Rusnák, who put in a Man of the Match performance in the second half, slotted home the opener. Vancouver tried to press forward as the conditions worsened, but they had no real goal threats, despite bringing on a couple of attacking subs, and you already felt it was game over. It basically was when RSL made it two in the 74th minute when Movsisyan showed some nice footwork in the box to make space on Waston and drill the ball home low past his former teammate in Denmark, Ousted. Four minutes later and the ‘Caps woes were added to when Ousted flapped at a corner coming in, de Jong missed a header to clear, and Mulholland fired home into the empty net. There was little of note after that. Vancouver simply weren’t at the races from a formation and team that was always second best. The conditions certainly can’t be blamed as it was the same for both sides, and with the first half chances RSL missed, the ‘Caps can consider themselves fortunate not to be on the end of their worst ever MLS defeat.